For a fun-filled day that includes a run/walk, poetry reading (Marika is a participant), performing arts, both music and theatre, an artisans market, Zumba exercises, and a dogs for art competition. In the evening at the Texas Theatre there is a silent art auction (Marika has two pieces), wine and beer tastings, food, live music by the Dirty River Dixie Band and the announcement of the 2015 Outstanding Contributor to the Arts. 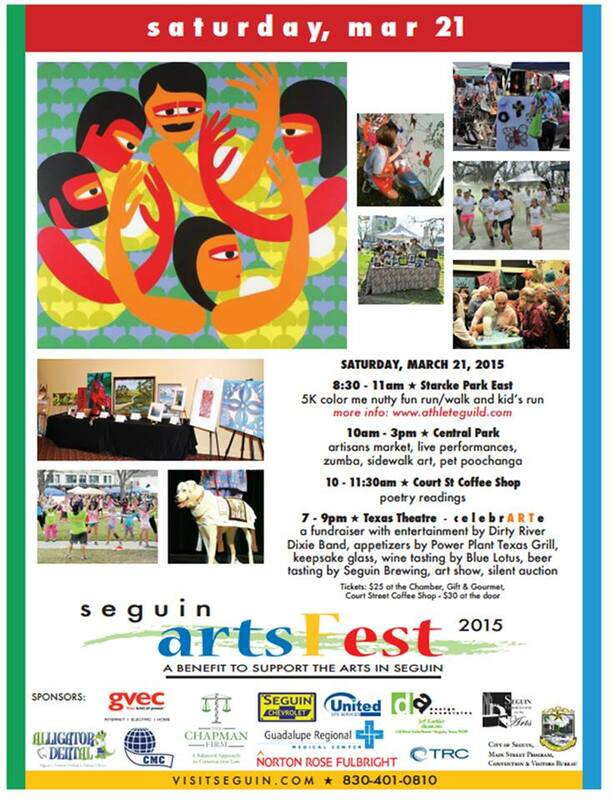 Join us at Seguin’s ArtFest 2015 on Saturday, March 21. For the complete schedule of events and a description of events see below the following image. This is a 5K color run/walk in at the Pecan Bottom Multi-Use Trail at Max Starcke Park. The paint is tempera paint which is non-toxic and 100% safe. The color is not fully washable from clothing but will rinse off skin in appropriate time. The paint does not contain soy, latex, casein, dairy, egg, gluten, peanut or tree root. Registration for the Color Me Nutty 5K Run/Walk prior to March 15 is $20 and includes a t-shirt. Registration after March 15 remains $20 but does not include a t-shirt. Registration on the day of the event is $25 and does not include a t-shirt. The Kids Color Me Nutty Fun Run includes a 50-yard dash for ages 1-3 and a one mile run for ages 4-12. Registration by March 15 is $10 and includes a t-shirt. Registration after that date, including the day of the event, remains $10 but does not include a t-shirt. Registration is available at athleteguild.com. Simply search “Color Me Nutty 5K Fun Run/Walk” in the search bar at the top right of the homepage. Listen to poets, young and old, while enjoying a nice cup of coffee at Court Street Coffee Shop. Shop a variety of vendors selling handmade items in Central Park. If you are interested in having a booth at the market, fill out an application at the Main Street website: http://www.seguintexas.gov/main_street/detail/artsfest or pick up an application at the Main Street Program office at 211 North River Street. Enjoy a fast paced dance exercise program in Central Park. Catch select scenes from the high school’s One Act Play in Central Park. Performance by local vocalist, Katie Poth in the Central Park Band Stand. Performance by the Navarro Jazz Band in the Central Park Band Stand. Central Park goes to the dogs for an art competition specifically for your K9 friend. Bring your dog in its best, most creative outfit to the Band Stand in Central Park. Suggested donation of $10. The Seguin High School and Junior High Mariachis perform in the Central Park Band Stand. Seguin’s annual celebration of the arts is quickly approaching. ArtsFest 2015 will include a Color Me Nutty Fun Run and Walk, Poetry Reading, Artisan’s Market, Zumba in the Park, Seguin High School Theater Performance, Pet Poochanga and CelebrARTe all in downtown Seguin. Events kick off early on Saturday, March 21, 2015 and wrap up late in the evening. CelebrARTe is a special evening of art, live music, great food, wine and beer tastings from local artisans, and great company all in the beautiful Texas Theater. Attendees can bid on items in the Silent Auction where all proceeds will benefit the Seguin Art League’s renovation of the Klein Opera House, the new home of the Seguin Art League. CelebrARTe tickets are available at Gift and Gourmet and Court Street Coffee Shop. They can also be purchased from any Arts Commission Member. They are $25 pre-sale and $30 at the door. A keepsake wine glass and three beer or wine tasting tickets are included in the price of the ticket. ArtsFest celebrates art of all forms in Seguin. For more information about ArtsFest 2015 call: (830) 401-2448 or visit: http://www.seguintexas.gov/main_street/detail/artsfest. This entry was posted in Art Auction, Seguin Art and tagged Dirty River Dixie Band, marika bordes, Seguin Art, Seguin ArtsFest, Seguin Commission on the Arts, Seguin Main Street Program, Texas Theater. Bookmark the permalink.